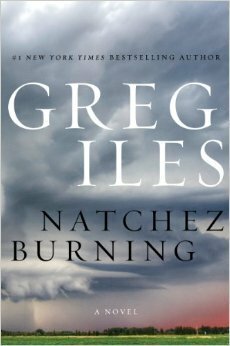 The South is still the South in small town Natchez, Mississippi in Greg Iles’s Natchez Burning. Forty years ago, the Ku Klux Klan was openly active, and a series of unsolved murders went unchallenged by local citizens. In present day Natchez, Mayor Penn Cage has trouble brought to him when the DA calls to tell him that his father may have murdered someone the night before. This isn’t the first book featuring Penn Cage and his family, but it’s the first one in a new trilogy focusing around them and the first Greg Iles book I’ve read. It definitely stands on its own, but it is weighty – both literally and figuratively. The book is almost 900 pages long – and it feels like it. The book started well but quickly got bogged down – for me – in detail. It was somewhat confusing to untie all the various plot threads. Though the main focus was on proving the innocence of Penn’s father Dr. Tom Cage, there is plenty more happening. The DA has a grudge against Penn Cage who has evidence that could get him disbarred if he shares it while there are plenty of good ol’ boys who want to keep the past buried. Couple that with Penn planning his wedding to the editor of the local paper Caitlin Masters and Penn’s father Dr. Tom Cage accused of murdering his former nurse who moved away from Natchez almost four decades earlier, and there is a lot going on. There are flashbacks between the past and the present as various characters remember the fraught days in the 60s where a well-liked music store owner was burned to death in his store and young black men disappeared. It is clear early on who the villains are, though it is far less clear what Dr. Cage actually did in the present to his dying nurse Violet Turner. He refuses to talk about what happened that night and goes on the run for reasons that are still not clear to me. The book often goes over the top in the action and adventure that characters face. It often felt more like a movie script to me than it did a book. Some of this took away from the seriousness of the situation because it was so over the top. The racism still alive today and the crooked law enforcement and businessmen became almost a caricature of themselves. A 900 page book is daunting by any stretch, and there are definitely times where Natchez Burning plodded along. There are definitely scenes and even storylines that could have been cut from this book to make it flow much better. That said, I became invested in the story about a third of the way through and am glad that I stuck it out because I ended up really liking the book overall, and I definitely plan on reading the rest of the trilogy – especially given how I was left hanging at the end of this book. Written by Michelle of Honest & Truly! who led a sheltered suburban upbringing where racism and corruption never intruded. She shares snippets of her life now on her blog Honest & Truly! and you can also follow her on Twitter where she is @HonestAndTruly.